View the Labels/SDS information for Concert II Fungicide. Concert® II fungicide provides golf course superintendents with preventive disease control on greens, fairways and roughs. Using a proprietary blend of the active ingredients from Banner MAXX® II and Daconil® it is an important component of spray programs for cool-season grasses. 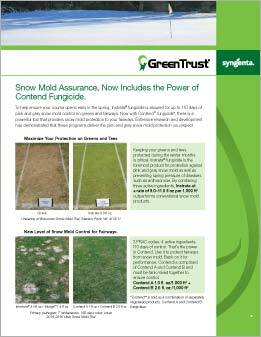 Syngenta Snow Mold Assurance Program takes the uncertainty out of pink and gray snow mold protection on greens, tees and fairways. 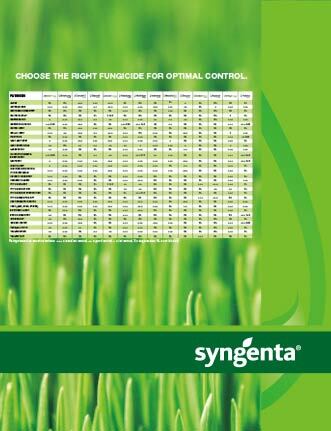 Use this chart to help choose the right fungicide for optimal control. ©2019 Syngenta. Important: Always read and follow label instructions. Some products may not be registered for sale or use in all states or counties and/or may have state-specific use requirements. Please check with your local extension service to ensure registration status and proper use. Concert®, Greencast® is a trademark of a Syngenta Group Company. SuperWeatherStik® is a trademark of a Syngenta Group Company.